The DES-1100 Fast Ethernet Smart Switch Series features a full set of configurable functions that provide strong performance and scalability. With an easy-to-use management interface accessible via a PC utility or web browser, the DES-1100 Fast Ethernet Smart Switch Series helps customers to quickly and easily deploy their network. The DES-1100-24 is a 24 port 10/100Mbps Fast Ethernet Smart Managed Switch which features a full set of configurable functions that provide strong performance and scalability.With an easy-to-use management interface accessible via a PC utility or web browser, the DES-1100 Series helps customers to quickly and easily deploy their network. The DES-1100 Series provides a complete and affordable solution for small and medium businesses, and for communities without IT staff. They are suitable for Enterprise deployment, such as in branch offices and meeting rooms that require simple management. 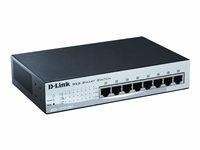 DES-1100-24: 24 x 10/100 Mbps ports Fanlesss Switch management can be performed through a web management interface or through the SmartConsole Utility. The DES-1100 Series also supports Layer 2 features such as port mirroring, statistics, and IGMP snooping to optimise performance for multicast applications. All models are fanless and enclosed in a metal case. The DES-1100-24 offers best-in-class power savings compared to other models, saving 27.32% more energy than a conventional D-Link unmanaged switch. This gives you an energy-efficient switch that costs less to operate. Additionally, this allows the switches to run cooler, run silent, and have a longer lifespan. 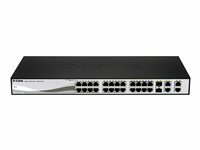 The DES-1100-16 is a 16 port 10/100Mbps Fast Ethernet Smart Managed Switch which features a full set of configurable functions that provide strong performance and scalability.With an easy-to-use management interface accessible via a PC utility or web browser, the DES-1100 Series helps customers to quickly and easily deploy their network. The DES-1100 Series provides a complete and affordable solution for small and medium businesses, and for communities without IT staff. They are suitable for Enterprise deployment, such as in branch offices and meeting rooms that require simple management. DES-1100-16: 16 x 10/100 Mbps ports Fanlesss Switch management can be performed through a web management interface or through the SmartConsole Utility. The DES-1100 Series also supports Layer 2 features such as port mirroring, statistics, and IGMP snooping to optimise performance for multicast applications. All models are fanless and enclosed in a metal case. The DES-1100-16 offers best-in-class power savings compared to other models, saving 27.32% more energy than a conventional D-Link unmanaged switch. This gives you an energy-efficient switch that costs less to operate. Additionally, this allows the switches to run cooler, run silent, and have a longer lifespan. The DES-1210-08P is a PoE switch in the Fast Ethernet Smart series. Equipped with 8 Fast Ethernet ports, this switch integrates the features of the Smart series with PoE functionality. With an easy to use web interface and eco-friendly design, the DES-1210-08P helps customers to quickly and easily deploy their networks, saving energy and money. The DES-1210-08P is the ideal solution as an advanced edge switch for SMB and enterprise networks. The Asymmetric VLAN support will provide access to shared resources such as servers or the Internet, without complicated VLAN configurations. Additionally, the innovative AutoVoice and AutoSurveillance VLAN features allow for easy integration of 3rd party IP phones and network cameras, placing traffic from these devices in separate VLANs. The DES-1210-08P complies with the 802.3af PoE standard. This gives you extra flexibility at deploying appliances such as wireless Access Points, IP cameras and VoIP phones in your network, even in mix-vendor environments. For added flexibility and power-saving, the DES-1210-08P integrates the new Time-Based PoE feature, which turns off the power when it is not needed, for example, at nights or during the weekends. This means that PoE-powered devices which otherwise would be always on, can be switched off centrally, saving power and money. Extensive set of features Equipped with a complete line-up of features, these switches include Quality of Service, port trunking, Spanning Tree and IGMP snooping. Network monitoring and maintenance features include port mirroring, loopback detection and the innovative cable diagnostics. With cable diagnostics, the switch will flag a faulty Ethernet cable connected to any of its ports, detailing the type of error detected. Secure your network The DES-1210 series support RADIUS authentication, to ensure that only authorized users are able to log into the network. In addition, the Access Control List (ACL) feature further enhances security by ensuring that network resources are accessible only by their legitimate users. Avoid network disruption D-Link's innovative safeguard engine protects aginst traffic flooding caused by broadcast storms or virus attacks, blocking traffic that reaches the definable threshold and avoiding network lock-ups before they occur. Spanning Tree (STP) and Rapid Spanning Tree (RSTP) allow for redundant paths in a network to ensure servers and other resources are always available. Versatile management The new generation of smart switches is provided with an intuitive PC-based smartConsole utility and a friendly web interface that enables administrators to configure and control their network down to the port level. The smartConsole automatically discovers multiple D-Link Web smart switches within the same network segment, so administrators can access all of them even before they have been configured. This allows for very quick deployments and initial setups. For more advanced administrators, the DES-1210 series supports a Command Line Interface (CLI) accessible with Telnet. The DES-1210-28P is the first PoE switch in the Fast Ethernet Smart III series. Equipped with 24 Fast Ethernet ports, 2 Gigabit ports and 2 additional Gigabit copper/fiber combo ports, this switch integrates the features of the successful Smart III series with PoE and the PoE+ functionality. With an easy to use web interface and eco-friendly design, the DES-1210-28P helps customers to quickly and easily deploy their networks, saving energy and money. The DES-1210-28P is the ideal solution as an advanced edge switch for SMB and enterprise networks. The 4 additional Gigabit ports allow for fast and reliable copper or fiber uplinks to the rest of the infrastructure. The Asymmetric VLAN support will provide access to shared resources such as servers or the Internet, without complicated VLAN configurations. Additionally, the innovative AutoVoice VLAN feature allows for easy integration of 3rd party IP phones, placing VoIP traffic in a separate VLAN, thus ensuring the quality and security of VoIP traffic. Extensive Layer 2 features Equipped with a complete line-up of features, these switches include Quality of Service, port trunking, Spanning Tree and IGMP snooping. Network monitoring and maintenance features include port mirroring, loopback detection and the innovative cable diagnostics. With cable diagnostics, the switch will flag a faulty Ethernet cable connected to any of its ports, detailing the type of error detected.